Doodling is a great way to personalise your layouts and add your own sense of style. This layout shows you one way to incorporate it into your pages in a subtle manner so that even if you are not yet confident with this technique, you can still give it a go. 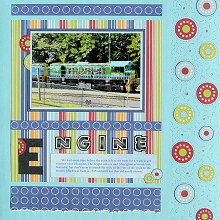 This layout was created using two papers from the Scenic Route North Shore Paper Pack (North Shore Barrel Navy Paper and North Shore Beach Break Paper), blue Bazzill cardstock, navy blue cardstock, light blue cardstock, black cardstock, blue ink, a blue pen and black alphabet stickers. Mat your photo with light blue cardstock and again with dark blue cardstock. Adhere towards the top of the striped paper on your layout, as shown above. Cut two strips of North Shore Beach Break Paper measuring approximately 20.5cm by 1.5cm. Ink the edges with blue ink. Adhere the first strip on your background just above and in line with the striped paper, as shown in the layout above. Adhere the second strip on the striped paper just below your photo. Cut another strip of North Shore Beach Break Paper measuring approximately 20.5cm by 4cm. Ink all the edges except the bottom edge with blue ink. Tear along the bottom edge. Adhere below and in line with the striped paper, as shown in the layout above. Place your journaling on a piece of blue cardstock measuring approximately 14.5cm by 3.5cm. Ink the edges with blue ink and adhere in the bottom right corner of the striped paper. Cut the first letter of your title from black cardstock. It should be approximately 5cm tall. Adhere in the bottom left corner of the striped paper. Use black alphabet stickers to complete your title. Place them above your journaling. Cut out a collection of circles from the North Shore Barrel Navy Paper. When cutting out the light blue circles, I recommend leaving a dark blue border around them so they will stand out from your page. Adhere a selection of them down the right side of your page, as shown in the layout above. Also, add two small circles to the bottom right corner of your journaling. If you wish, you can further dress up your page by adding semi-circles near the top left corner of your photo, as shown in the layout above. I have also added a red semi-circle to the first letter of my title. Finally, use a blue pen to add doodling around the circles on the right side of you page. I have used a collection of dotted curved lines and circles, but the final design is up to you.